In my practice, I’m seeing an increase in inherited Individual Retirement Accounts. That’s alerted me to an ever-increasing need for practitioners to review not only how IRAs fit into clients’ financial planning, but also to review and advise them properly regarding the beneficiary form and other key issues. Here are some things advisors and their clients need to keep in mind. An IRA is a ticking tax bomb. Unlike other assets, the income tax basis in an IRA inheritor’s hands will not be its fair market value upon death. That means the amount of an IRA’s potential taxable income will be taxed after death. Roth IRAs are an exception, as Roth IRA distributions generally aren’t taxable, whether withdrawn by the Roth IRA creator or its inheritors. The cure is stretch distributions. Those who inherit an IRA can often withdraw taxable distributions over many years. That’s better than drawing down the entire account all at once for two reasons: lower taxable amounts mean lower tax rates, compared to emptying out the account in a single tax year, and deferred taxes earn investment returns for the IRA beneficiary. But there are three very common threats to stretch distributions. The 5-Year Rule can force distributions that exhaust the IRA by Deccember 31 of the fifth year after the year of the deceased IRA owner’s death. In many cases, beneficiaries wait until the fifth year to take all the distributions, which can cause the higher income tax brackets to apply. The 5-year rule can apply if the IRA creator died before Apr. 1 of the year after the year attaining age 70 ½ (the year required minimum distributions must begin). The 5-year rule cannot apply after that. Because Roth IRAs don’t have Required Minimum Distributions during the Roth IRA creator’s lifetime, the 5-year rule can always apply to a Roth IRA. Failure to name beneficiaries for the IRA can cause the 5-year rule to apply. In many cases, IRAs become payable to the estate of the IRA creator if the beneficiary form hasn’t been filled out, signed and submitted to the IRA provider. That may mean a spousal IRA rollover won’t be possible. Besides causing tax disasters, probate costs (or increased probate costs) will have to be paid.Even if the 5-year rule could apply, it won’t apply if the IRA’s beneficiaries are all living individuals and one of those individuals qualifies the IRA for lifetime stretch distributions. That’s one reason filling out the IRA’s beneficiary form is so important. Eager beneficiaries are common. By that I mean: many beneficiaries brush off the advantages of stretch distributions to obtain a quick fix to perceived financial difficulties. Others do so to improve their standard of living, for example, to buy a home or car. When these things occur without first engaging in financial planning, the likelihood that money has been wasted or taxes unnecessarily paid increases. Naming a trust as beneficiary may help avoid this (see #8). A botched spousal rollover can derail stretchout. When the IRA creator’s surviving spouse is the IRA’s beneficiary, the best way to accomplish a spousal rollover is for the surviving spouse to make a direct transfer from the decedent’s IRA to a new IRA set up for the surviving spouse. Some IRA providers call this a spousal rollover IRA, but that nomenclature isn’t a tax law requirement. The risk of losing the spousal IRA rollover goes up when the surviving spouse receives into a non-IRA account funds from the decedent’s IRA. Also, checks sent to the surviving spouse sometimes get lost or misplaced. It may be possible to fix a botched spousal rollover when the 60-day rollover period is missed. The IRS has a process for requesting an extension of the 60-day rollover period. A private letter ruling must be requested. The spouse must be able to show there was some cause beyond the spouse’s control. Here’s just one example: when the spousal rollover wasn’t completed because a financial institution made a mistake, the IRS will grant an extension of time to make the rollover (the IRS calls this a waiver of the 60-day rollover requirement). Consider establishing a trust to name as IRA beneficiary. A trust is a legal entity you create that names a trustee to hold, manage and distribute property to one or more beneficiaries the IRA owner names in the trust. The IRA owner can direct who will receive distributions of trust property, as well as when distributions will occur. A trust makes it possible to regulate who gets IRA distributions and when. Trusts also tend to increase the chances that stretch distributions will be taken advantage of. IRA distributions may be stretched over the lifetime of a trust beneficiary if the trust is properly drafted. That’s why you’ll need the help of an attorney who is highly familiar with how to write trusts in a way that harmonizes with IRS regulations about IRA stretch distributions. Pay attention to the beneficiary form. Each IRA provider has its own beneficiary form. That form is a legal document that controls what happens to an IRA after the owner’s death. In many cases, the beneficiary form is only one or two page long and appears simple to use. But don’t be deceived by that seeming simplicity. A financial advisor or attorney should be engaged to review the form and advise how to fill it out.After the beneficiary form has been submitted, the IRA investment advisor should go into the computerized records of the IRA provider to confirm that the beneficiary or beneficiaries in their system match the owner’s understanding of what you submitted on the beneficiary form. Beneficiary forms should be reviewed by the IRA owner’s estate planning team regularly, to be sure that they are consistent with any changes in the plan. If an IRA is moved to another IRA provider, be sure to repeat the entire beneficiary form process (the beneficiary forms from the former IRA provider won’t apply to the IRA set up with the new IRA provider). Educate the beneficiaries. After the IRA’s beneficiary designation form has been completed, submitted and confirmed, consider informing the IRA owner’s beneficiaries that they have been so named. If you do share that information, educate your clients and their IRA beneficiaries about the value of engaging in their own financial planning, including becoming educated about the value of taking out distributions as slowly as possible. This idea of educating clients and IRA beneficiaries about what to do when inheriting an IRA is one of the main reasons why I decided to author my brand new book, Inheriting an IRA. This book, in just over 150 pages, is a very simple, straightforward, and easy read for clients and their IRA beneficiaries to know all of the necessary steps needed when inheriting an IRA. 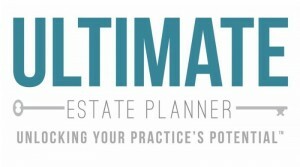 You can purchase a copy of this books, as well as multiple copies for your clients, through The Ultimate Estate Planner, Inc. For more information, click here. In conclusion, it’s extremely important as estate planning advisors – – whether you’re an estate planning attorney, financial advisor, CPA or some other type of professional that comes into contact with clients in the IRA planning process – – that you properly advise clients about these issues surrounding inherited IRAs. Clients spend years and years building up their retirement accounts and in my years of practice, I have seen countless cases where beneficiaries don’t know what to do and the results are disastrous! Written by one of the nation’s leading IRA experts, particularly in the area of inherited IRAs an working with client beneficiaries and issues surrounding inherited IRA assets, this book provides advisors not only an easy-to-follow guide on how to properly protect inherited IRA assets, but it’s written in such a way that advisors are encouraged to get this book and distribute directly to clients. There’s available space to put your business card, stamp, or other contact information of your firm’s name on the inside pages of the book. A must-have for any estate planner working with clients, their IRAs, and assisting the IRA beneficiaries! — Natalie B. Choate, Esq. Effectively creates a plain and easy-to-follow “script” for estate planners to guide their clients and beneficiaries through the IRA planning process. A unique tool to give clients and provide third-party guidance from some of the best IRA experts in the nation about the critical issues surrounding inheriting IRA assets. Developing a Client Succession Plan, by effectively creating relationships with the client’s beneficiaries and helping you get repeat business. Mike Jones will be presenting a special 90-minute presentation entitled, “Explaining the Inherited IRA Rules to Your Clients” on Wednesday, June 25th at 9am Pacific (12pm Eastern). For more information and to register, click here. PLUS, the first 25 people to register will get a FREEcopy of Mike’s new book, Inheriting an IRA! REGISTER NOW! Michael J. Jones is a partner of Thompson Jones LLP, a tax consulting practice that focuses on sophisticated wealth transfer strategy, trust and probate matters (both administration and controversy resolution), family business transitions, and taxpayer representation before the IRS. He is a noted authority on estate planning for IRA and retirement plan benefits, and chairs Trusts & Estates magazine’s Retirement Benefits Committee. Mike was listed among CPA Magazine’s Top 50 IRS Practitioners and Top 40 Tax Advisors to Know During a Recession. Mike has been quoted in numerous prestigious estate, tax, and financial publications over the years. He is the author of the new book titled, Inheriting an IRA, a plain-English guide for consumers to understand the importance of what to do (and what not to do) when inheriting IRA assets. If you would like more information or have a question for him, he can be reached at 831.373.1800 or by e-mail at mjj@tj-llp.com.